First off, basing an entire book on solving the P=NP problem is a bit of a risky gamble. Most people have limited understanding of advanced mathematics, so describing this conundrum of complexity theory walks a fine line between not enough information and an exposition dump. Fortunately, Factor Man is able to maintain that balance, even if many of its sections and POVs did start to trend into exposition for exposition’s sake. I mean, I understand the reasoning behind the New York Times’ coverage of the lead-up, but each of the articles didn’t read like they would have come from the New York Times. I will say that the strength of this book lies in its buildup. A lot is riding on the successful execution of Factor Man’s plan, so his meticulous attention to detail to ensure every part of it comes to fruition was entertaining, to say the least. The mystery of Factor Man’s identity helped to drive the story forward, but once he became part of the narrative, much of this mystery vanished. About half-way through the book, the momentum starts to drag as it becomes evident that there will be no twists present all the way to the anti-climactic ending. Now, don’t get me wrong, I looked forward to the lunch breaks where I could sit down and read this book. The story pulled me in, but there were enough little problems in it that I can’t give it a full five stars. From how the story seems to be distracted by the author’s opinion on a few topics (including steroids and flying on airplanes) to a solid plan that didn’t leave room for surprises, this thriller will get the job done, but it could have certainly been better. However, considering this book was Matt Ginsberg’s first novel, I must give him credit for creating something that was at least unique in its subject matter. 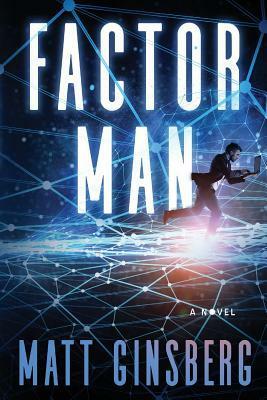 An educational piece about impossible mathematics in the skin of a thriller, I give Factor Man 3.5 stars out of 5.